Today was Avery's first day of Ballet! She did such a good job and I was so proud of her! 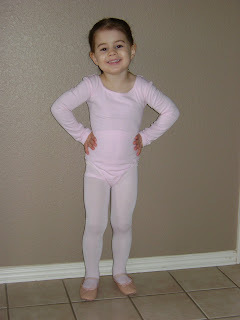 She looked adorable in her leotard, tights, and ballet shoes...thank you Nona! I was really worried she would stand there and do nothing, but she didn't at all. She did everything the teacher asked and I think it helped that there were only two other little girls in her class. She really had a good time and enjoyed dancing and singing to the songs. Here are a slew of pictures, and a couple videos. In a lot of the pictures, Avery has her tongue either in her cheek or in her bottom lip. That's what she does when she's a little nervous or shy, so it was in there a lot during class, but she still did everything she was supposed to!! how adorable! 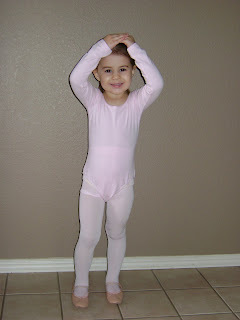 i can't believe she's old enough to be a little ballerina! time flies.